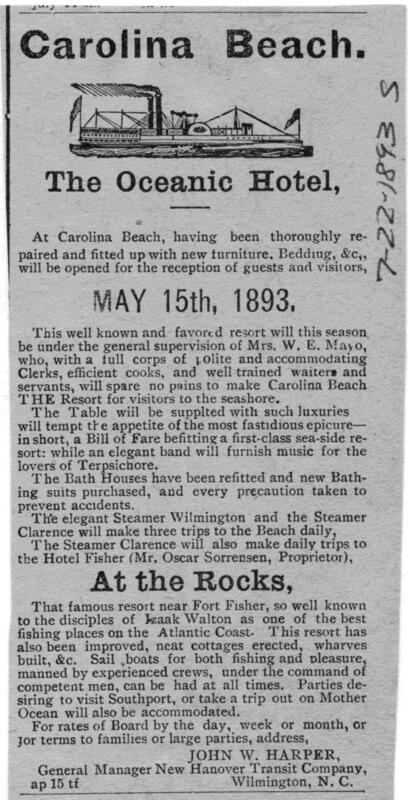 Carolina Beach, as a seaside resort, has great advantages, as reported in The Wilmington Messenger, dated August 22, 1897. The best proof of this is that it is visited by thousands annually. It has become the Mecca of excursion parties. 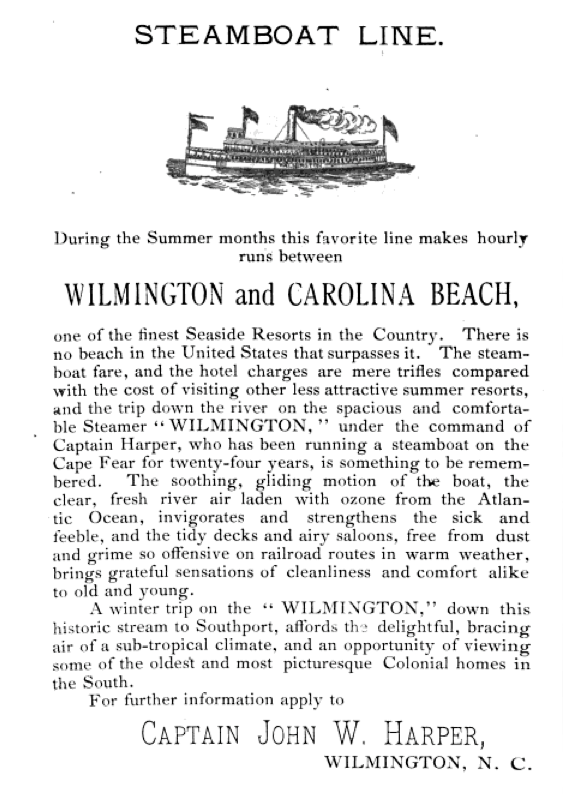 In the summer of 1896, the steamer Wilmington, which conveys passengers to the beach from Wilmington, sold, as it is shown by its returns to the inspector of steamboats, 32,000 round trip tickets. During this summer since the opening in May, 1897, to the present date, the steamer Wilmington, has taken up, in round numbers, 48,000 round trip tickets. Of these, Captain Harper estimates that one-half were visitors from the Wilmington area and one-half were visitors from other section of North Carolina and other states, and this number of tickets does not represent the whole number of persons carried, for no charge is made for children under the age of 10 years, and there are thousands of these that annually visit the beach. One might write volumes in description of Carolina Beach, and yet could write nothing that would praise in higher terms the attractions of this resort than this simple recital of facts. Carolina Beach and Captain John W. Harper are associated together in the public mind. Previous to 1885, he commanded the steamer, Passport, plying between Wilmington and Southport, and during the summer months, carried many excursion parties and passengers down the river. 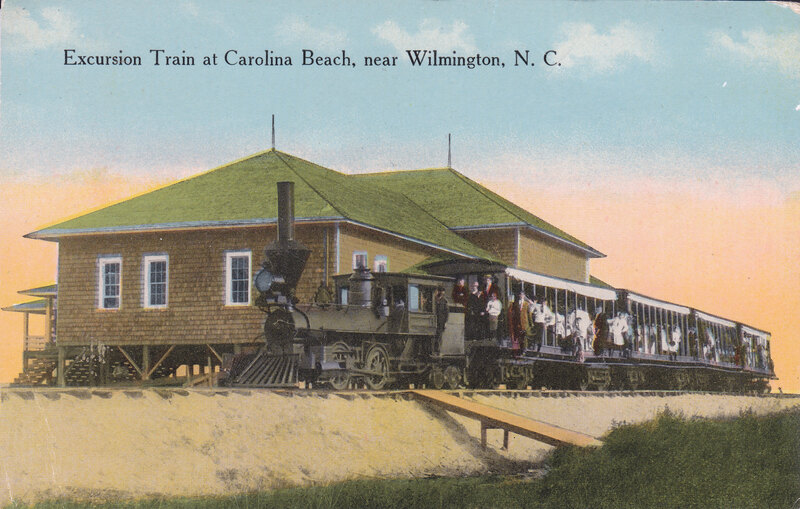 He conceived the idea of a seaside resort on the ocean beach, with a railroad across the narrow peninsula lying between the ocean and the river, there to connect by steamer with the City of Wilmington. He organized the New Hanover Transit Co., which constructed the railroad, and located the resort at the lower end of Masonboro Sound immediately on the Atlantic Ocean. He named the place Carolina Beach and in the summer of 1885 the resort was first opened to the public. The little steamer, Passport, the pioneer in this river excursion parties, now out of service, is pleasantly remembered in association with the beach. From the first the resort was a favorite. At first, patronized chiefly by the Wilmington people, it has since grown into larger proportions and now includes in its frequent visitors people from all sections of this and other states. 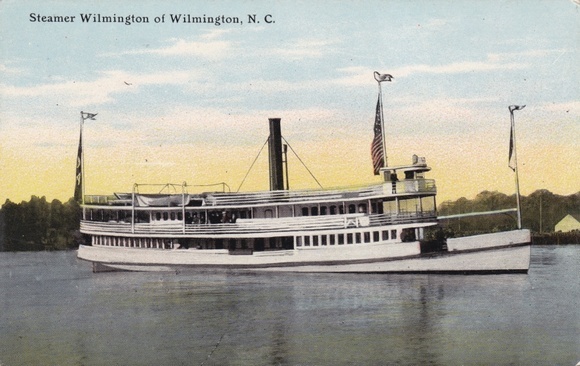 The steamer, Wilmington, runs between Wilmington and the river pier, conveying passengers and freight. It is a comfortable, swift, and commodious steamer, designed especially for her present character of transportation. She is in length 135 feet, breadth 23 feet, tonnage 110 net, double decked, compound engines, and is allowed by the United States steamboat inspection service to carry 600 passengers a trip. She can carry 2,000 passengers a day, as she makes five trips daily. 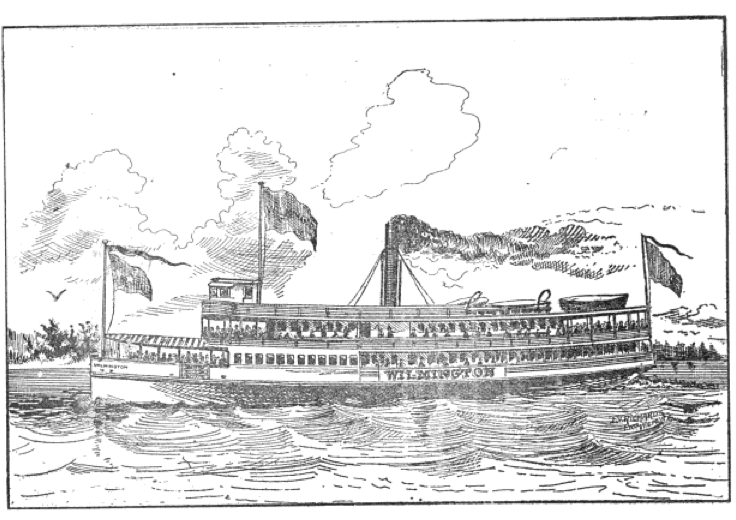 The steamer is owned and commanded by Captain Harper. He likewise owns a controlling interest in the beach and the railroad across from the river to the ocean. To this fact may be ascribed, for he is a man of executive capacity and experience, the safe, smooth, and easy system by which the large crowds are handled. 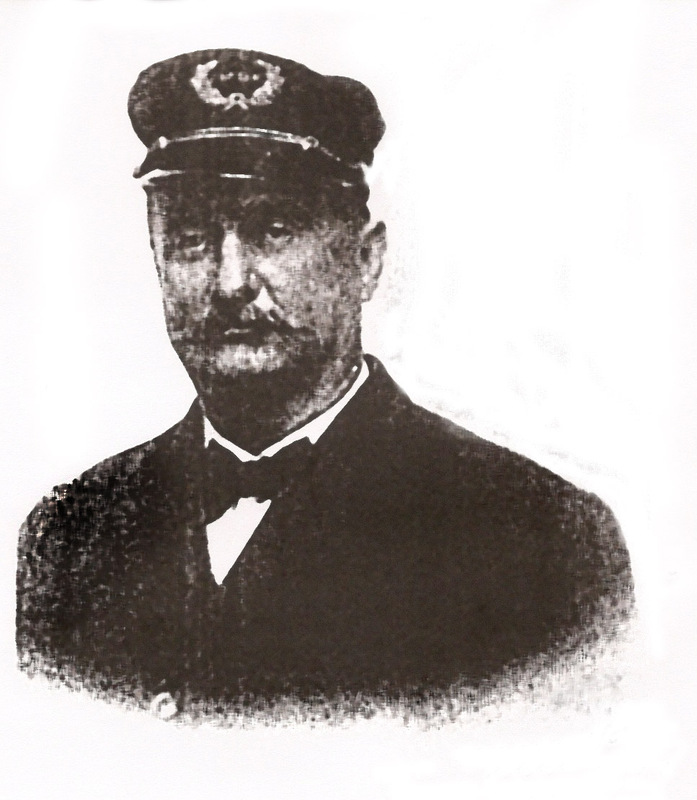 Captain Harper has had an experience of twenty-one summers in handling passenger steamers on the Cape Fear. In this time he has never lost a day in the service, nor ever had an accident on any of the boats under his command. He commands order and requires of his crew and passengers a courteous consideration for the pleasure, comfort and rights of the many who travel under his care. The visitor boards the steamer, Wilmington, at her pier, in the City, the foot of Market Street, and the steamer having cast her moorings he finds himself swiftly gliding down the river, which is a broad and beautiful stream, passing on either side scenes of historic interest and natural attractiveness. The sea breezes, which sweep up the river, refresh and invigorate, while passing ships, steamers, tugs, both domestic and foreign, which ply along the river, engaged in local, domestic and foreign commerce, enliven the scene, as the steamer speeds on to the pier of the New Hanover Transit Co. – a distance down the river of about fifteen miles. At the pier of the New Hanover Transit Co., which is the river terminus of the railroad running between the river and the Atlantic, Ocean, in length three miles, the passenger is transferred to the railroad car, and after a few moments ride on the train through woodland scenery, he is landed at Carolina Beach, in jumping distance of the great ocean. He has made the trip from Wilmington in one hour and fifteen minutes. The site of Carolina Beach has been well selected. The hotel, pavilions and cottages are all situated on the beach, fronting the ocean. There is a stretch of twenty miles of beautiful beach. It is wide, hard, smooth and slopes gently to the ocean, extending northward to Masonboro Inlet, which divides this beach from the beach at Wrightsville, and southward as far as the celebrated Fort Fisher. Behind the cottages lay the waters of the lower end of Masonboro Sound, which affords delightful still water bathing and opportunities for fishing and sailing; back of the site are pine groves, water oak and woodland scenery. It is within one-half of a mile of what is known as Camp Wyatt. Here in the Civil War the Confederate soldiers stood guard of the coast defenses. As one looks out upon the Atlantic, he sees the wrecks, still two or three blockade runners, which failing in their attempt to run into New Inlet and escape the blockade, were destroyed rather than permit them to pass into the hands of the enemy. It is perfectly healthy, for the land upon which it is situated is dry and well drained. The visitor breaths only the pure air of the ocean. The sea breezes make it always cool and refreshing. The surf bathing is rendered comparatively safe by the gentle slope of the beach. To say that the ocean water is better here than elsewhere on the coast might strike an inland man as exaggerated. The fact is, however, the water of the ocean further south is too warm and insipid; farther north it is chilled and one can remain in it but a few moments. The temperature of the water here, as along this Carolina coast, is neither to warm or too cool; it has a delightful temperature. It is nothing for surf bathers to remain in the surf for an hour, with impunity, and as in this time one is undergoing continuous active exercise, accompanied by the pleasure of bathing, the benefit is greater than where his bathing is made necessarily short by the discomfort of the water. there are all the facilities, of course, for surf bathing and protection to bathers while in the enjoyment of the sport. There are splendid opportunities for fishing either in the ocean or in the sound, and sailing, either over the smooth waters of Masonboro or the rolling billows of the ocean. The sheep-head, drum and sea-trout are the fish usually landed by the sportsman. The beach excellent facilities for driving and bicycling, and is a play ground for the children of endless interest and amusement to them. All the pleasures of the sea are here. The Oceanic Hotel is kept by Mr. R. A. Jenkins. It is the rendezvous of excursion parties. The proprietor does not undertake to serve Delmonico meals, but one may have at all times well served sheepshead, soft shell crabs, shrimps and, in season, oysters, as well as all the delicacies that come out of the sea. The hotel comfortably accommodates a limited number of transient boarders. There are forty private cottages at Carolina Beach, owned by residents at Wilmington, Charlotte and elsewhere. The housewife has comparatively little trouble in keeping house. Merchants of Wilmington send daily to the cottages for orders and deliver goods at the door. The fisherman and truckers deliver in like manner fish, game and vegetables. Water is supplied by water works and sanitation provided in modern methods. The cottage life of this resort is one of the most agreeable and peculiar features. The afternoons and evenings are spent in many kinds of social enjoyment and in the interchange of hospitalities between the cottagers. Time passes among them, not in the nervous and enervating excitements of fashionable life, but in the quiet, peaceful life and occupation suggested by the fresh air and natural environments of the place. The management reserves at all times the best of order, although there are few temptations to invite on the part of anyone the least disorderly conduct, and as a result of the excellent decorum alike among permanent and transient visitors, there is a feeling in the cottage life of security and protection that lends additional pleasure to the resort. Of course, one is not here out of the world, as the newspapers are delivered to him by 7 o’clock in the morning and there are two mails a day each way to Wilmington. Carolina Beach is no longer an experiment. It is an assured success. Every year has marked an increase in visitors. The coming years will show it’s still greater development. Captain Harper realizes that another year will be under the necessity of running two instead of one boat to the beach. There is in contemplation the erection of a fine club house in another year. Enlarged hotel facilities will come. The prospect of this pioneer of seaside resorts along the Cape Fear shores is destined to become one of the famous resorts of the Atlantic seaboard.